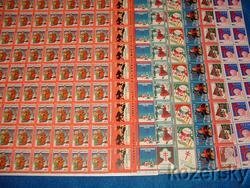 1932-39 U.S. National Christmas Seals, Sheet Collection, full gum, F, MNH. Issued each year at Christmas by the National Tuberculosis Association (NTA). Dealer stock, not from a collection. Pristine, full brilliant colors, full gum, shipped flat. 1930-39 U.S. National Christmas Seals, Sheet Collection, full gum, F, MNH. Issued each year at Christmas by the National Tuberculosis Association (NTA). Eight (8) full sheets - one (1) for each year, 1932, 1933, 1934, 1935, 1936, 1937, 1938, and 1939. An excellent and economical way to begin a Christmas Seal sheet collection.